Get the Chinoiserie Look with these 3 decorative arts: Asian porcelain, lacquerware, and cloisonné. Learn about the history of Chinoiserie decor and collecting tips. Can we all agree that the Chinoiserie look is très chic? This traditional style with a twist of whimsy delights those with a more is more philosophy — the color seekers as well as the pattern players. It is a bold, fanciful interior style that layers pattern, color, texture, and collected accessories for a lush design. Chinoiserie /shin-wahz-ree/, French for Chinese-esque, is a design and décor style inspired by the art and culture of China, Japan, and other Asian countries. It developed in Europe in the 17th century as explorers and merchants began traveling to the far East and bringing back stories and drawings of this exotic locale as well as importing Asian silks, porcelain, and lacquerware. By the mid-1700’s a craze for all things Asian swept Europe, and designers, artists, and craftsmen there started to create their own fanciful versions of these wares. Chinoiserie decorating is all about drawing inspiration from Asian decor and design. 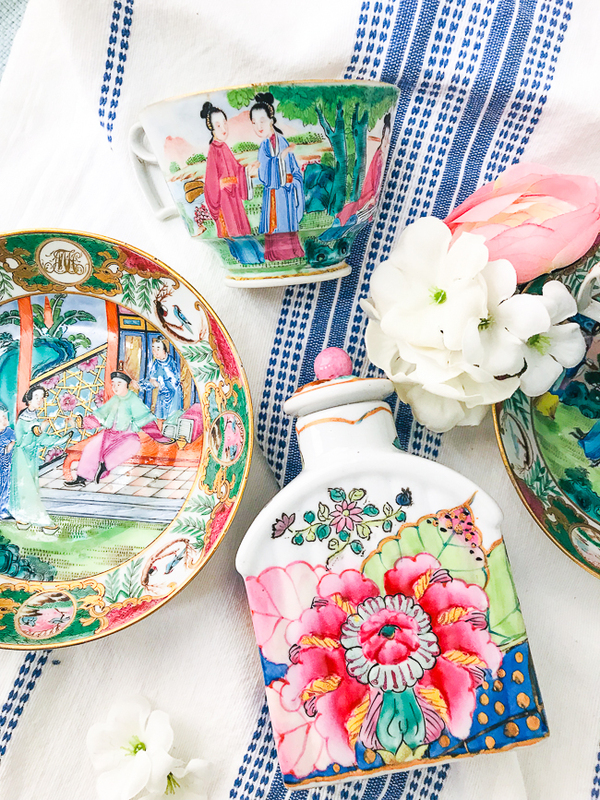 To get the Chinoiserie look in your home incorporate one or all of these 3 decorative accessories: Asian or Asian inspired porcelain, lacquerware, and/or cloisonné! I dare you to find a Chinoiserie chic room that doesn’t have at least one of these pieces of decor. Go ahead try! Impossible, right? 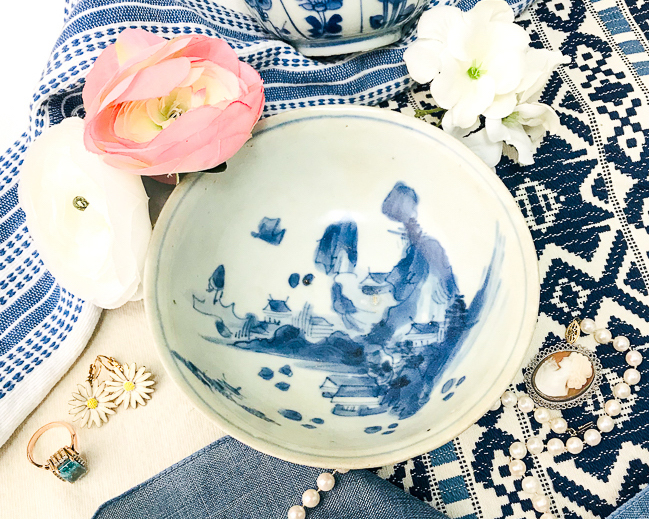 Blue and white ware is the most iconic of all ceramics and when introduced to Europe in the 17th century blossomed a craze for this beautiful palette. The Chinese first used cobalt blue as a painted decoration on porcelain with the style taking off in the Yaun Dynasty (1279-1368). After a potter shaped the bowl or vase and it dried, the design was painted on with cobalt oxide–called an underglaze—before applying the glaze and firing the piece. Many of the jar forms were originally used to store precious spices and tea, but by the 1700s blue and white ware was ordered in bulk for export to Europe and came in a variety of dishware shapes and sizes. These iconic ceramics are chic and easy to decorate with because blue and white is a straightforward contrast that can pair with anything! Whether you use a rounded ginger jar or a beautiful bowl or opt for a more unique form like a moon flask or garlic vase, you’ll find these decorative accents add charm to a space and help you get the Chinoiserie look. Pieces with genuine reign mark can be worth 10x more than unmarked pieces. Test the weight and heft of blue and white ceramics. Porcelain has a light but solid feel with older ginger jars feeling heavier. The texture of porcelain is smooth not grainy and colored white whereas earthenware is opaque red or tan in color with a grainy texture where chipped and stoneware is opaque brown or gray in color. As part of the craze for all things Asian, European potteries latched on to the popularity of blue and white ceramics, creating their own versions like Delft ware in the Netherlands. Delft is a tin-glazed earthenware and can be distinguished by a gritty texture, thick glaze, and peppering to the surface. Typical decorations include bold, geometric florals, picturesque landscapes, as well as Chinoiserie motifs. Once the secret to porcelain was discovered European ceramics manufacturers like Lowestoft and Liverpool also produced significant quantities of blue and white wares. By the early 1800’s technological improvements in Europe resulted in the mass production of ceramics, which became affordable to an increasing middle class. Transfer printing was one such technique that allowed the quick and cheap decoration of vessels with detailed classical, landscape, or historical scenes. Think blue and white Spode and other Staffordshire potteries. Of course, it is truly Chinoiserie if you use a piece of European porcelain made to look Chinese. Just be aware that all blue and white ware with Asian motifs is not Chinese nor necessarily porcelain. 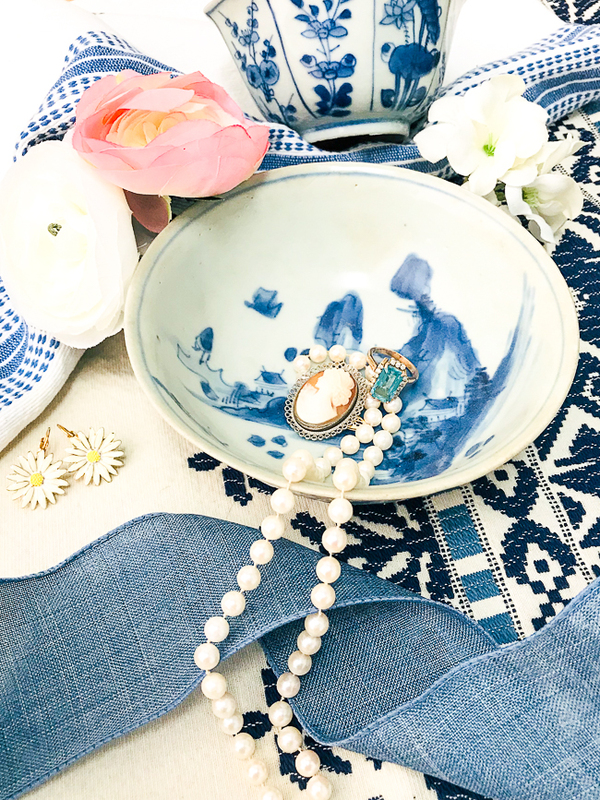 Blue and white ware while the most popular and classic is not the only Asian porcelain to consider when decorating in the Chinoiserie style. Famille rose porcelain is another key accessory in the Chinoiserie look. Popular during Yongzheng period (1723-1735), the name refers to the new color palette which included a pale rosy pink enamel for the first time. Introduced by the Jesuit missionaries in the Qing court, this new enamel instigated a new color scheme of rose pink, purple, green, and yellow. Brighter colors along with improved opacity allowed depiction of more complex images in famille rose. Vast quantities were exported to Europe during 18th and 19th centuries. Imari, a style of Japanese porcelain developed in the late 17th century, is also a wonderful addition to a Chinoiserie themed space. Made in Arita and shipped to Europe from port of Imari, hence the name, this style of ceramic is a bold, colorful choice. Characterized by a palette of dark underglaze blue with iron-red, gold, green and sometimes purple, designs often include flower baskets and textile-inspired patterns. Imari was copied by the Chinese as well as the Europeans. Using Asian or Asian inspired ceramics will help you get the Chinoiserie look. There is much versatility in how you choose to use these pieces. Ginger jars and large urns in graphic blue and white pop on mantels and bookshelves alike. They make gorgeous vases for floral arrangements and unique storage containers on kitchen cabinets. If you are looking for more colorful accents, adorn your table with a set of tobacco leaf dishes or set an elegant tea with a famille rose tea set. Use small dishes as catch alls on the vanity or entry table. Plant orchids in a large Imari or blue and white cachepot. There are so many options. 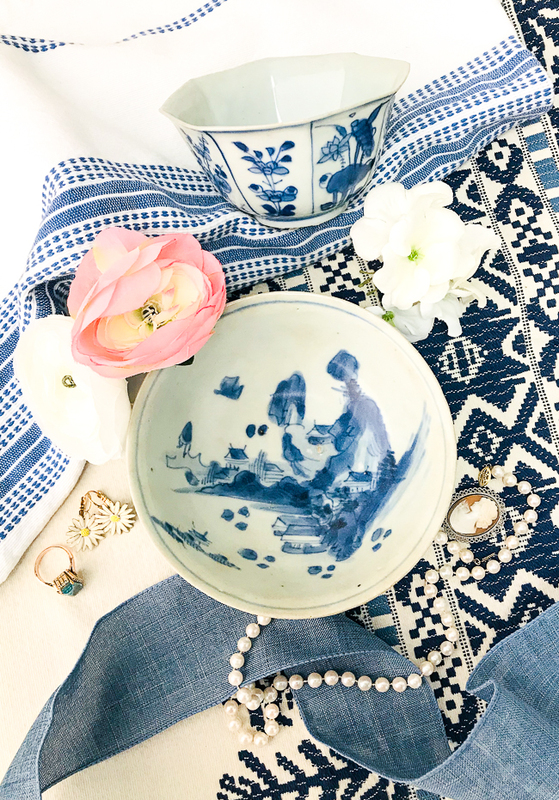 Get creative with these beautiful ceramics to decorate for a Chinoiserie chic look! Cloisonné is a colorful accent when decorating Chinoiserie style. It is an ancient technique developed in the Middle East that came to China sometime in the 15th century. The word is French, deriving from “cloison” which means “partition,” and this is the foundation for the technique. Thin metal wire is applied over a copper or bronze vessel in various designs – landscapes, birds, florals, etc. Then the compartments of the metal filigree are filled with enamel paste. The vessel is fired in a kiln and more enamel added to build up the surface. Each vessel may involve as many as 37 steps. Cloisonné objects were intended primarily for the furnishing of temples and palaces, because their flamboyant splendor was considered appropriate to the function of these structures but not well suited to a more restrained atmosphere like the home of a scholar. By the mid-1400’s, this ware was greatly prized at court. Most cloisonné is Chinese or Japanese. Blue was the most common color for Chinese cloisonné enamel, and bronze, then copper, was used for the vessel and wire. Pieces marked “China” are twentieth-century examples. Cloisonné is fragile, and even minor bumps can break or dislodge the enamel and dent the body. So always be cautious handling, and when buying don’t pay much for pieces with dented sides and broken enamel. More expensive pieces should be brightly colored with a beautiful iridescence in unique shapes and intricate designs with gilding or precious metals. 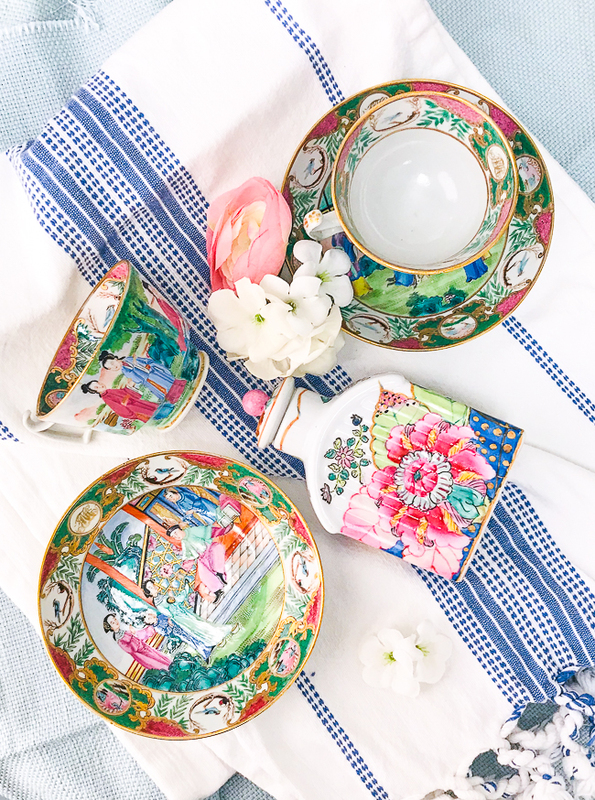 The bright colors in cloisonné are a wonderful pairing with blue and white ceramics. 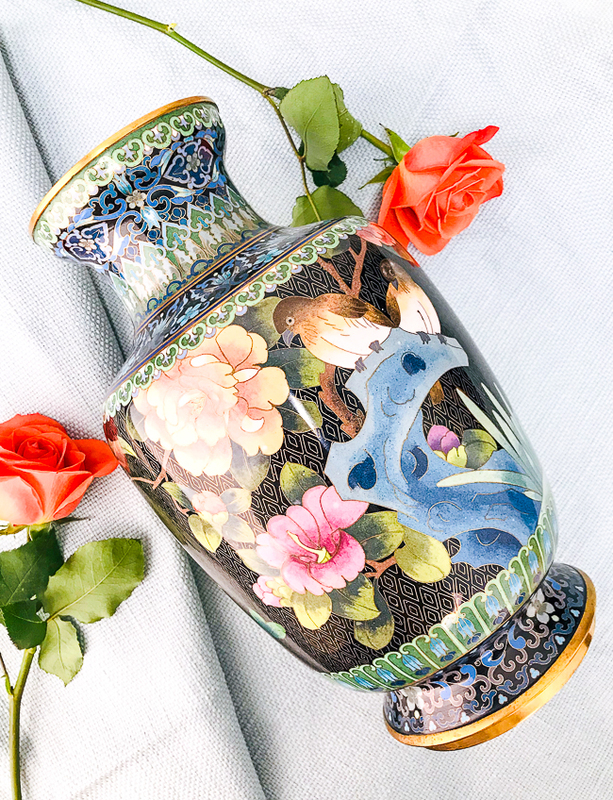 Cloisonné accents are also a great choice to add Chinoiserie motifs to a room, such as phoenix, dragons, exotic birds, peonies and mille fleurs. The juxtaposition of these motifs make for a fun pattern play. 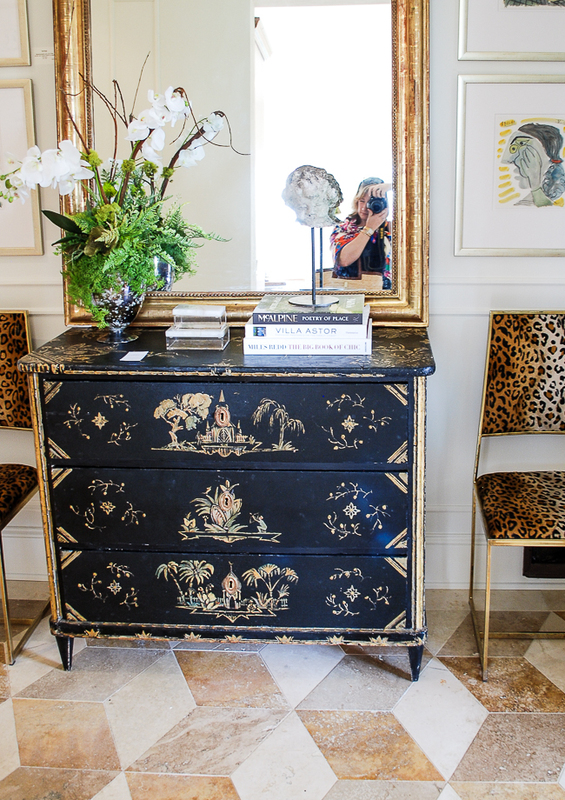 For lovers of maximalism this Chinoiserie pattern play is perfection. after all Chinoiserie and maximalism go hand in hand. Both are all about the layers — layers of pattern, texture, color, and decorative collections. There is a feeling of abundance and exuberance when maximalism goes Chinoiserie that just works. Lacquering, a technique developed in China, involves the application of numerous layers of varnish onto wood, leather, fabric, or other surfaces. The varnish derived from tree sap forms a hard protective shell that can be carved and further embellished with hand-painted scenes and inlaid details. Traditional Asian lacquerware pieces are true works of art and require immense skill to craft. The technical difficulties involved in working with lacquer — not to mention the toxicity of the sap — meant it could only be handled by specialist craftsmen. European traders in the 16th century began bringing lacquer objects to the West, where they caught the eye of European collectors — including Marie Antoinette. Artisans began making lacquerware specifically for the European market in different forms with more Western motifs. Marie Antoinette’s collection of Japanese lacquer is fascinating for being comprised of mostly domestic-taste lacquer, rather than the export ware so popular in Europe at the time. The collection is split between the Louvre, the Musée Guimet in Paris, and the palace of Versailles. Japanning is a similar technique but with varnish made from the lac beetle and often refers to European made versions of lacquer. Diverse decorations from highly intricate applications to more simplistic designs although there are 2 main forms: pictorial surface decoration and carving. Lacquer is very tactile. It’s important to personally handle lacquer objects you consider for purchase. It does not fair well in dry conditions, which will cause the lacquer to crack and layers to separate. One of the main types of Japanese lacquer decoration is maki-e, which involves sprinkling the lacquer surface with gold or silver powder to build up a pictorial design. Cinnabar is another common style of lacquerware and is made from mixing crystallized red mercuric sulphide (cinnabar) in the layers of lacquer. Then the object is carved in intricate designs and landscape scenes. These decorative objects are a deep red. Look at the gradually tapering cuts with a 10X loupe to see a grain-like pattern of concentric rings. All carved pieces show at least some evidence of tool marks produced by carving. Molded objects show tell-tale production marks associated with plastic and other synthetic materials, including mold seams, pits from broken air bubbles, and swirls within the material. Saw marks across the bottom of a piece are a sure sign of a fake. 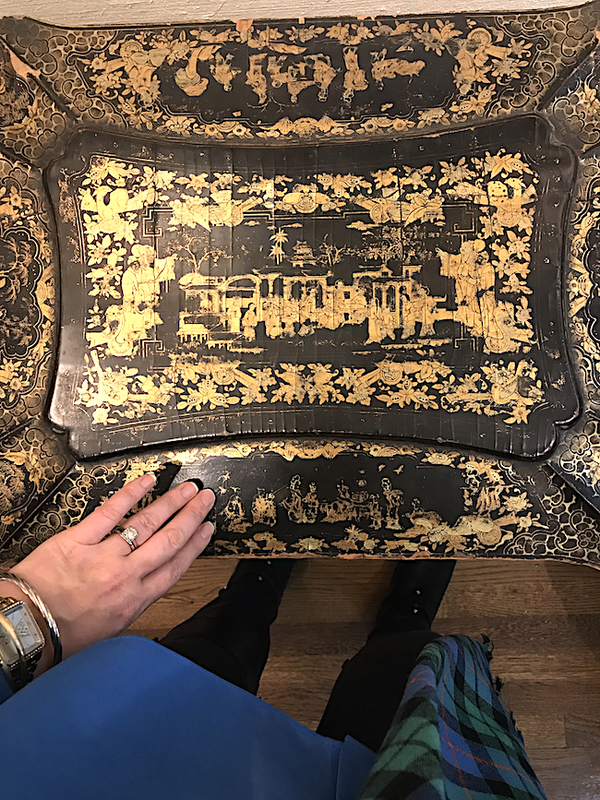 Lacquerware has the potential to add texture and visual interest to a room when decorating with Chinoiserie. The polished shine of lacquer is eye-catching and reflective. It is also a great way to add metallic accents to a space. Whether you opt for a large lacquer cabinet or smaller decor accessories, choose one style of lacquerware to use in a space. Cinnabar is a bold accent to add to bookshelves and consoles, while the dark but glittery maki-e is subtly intriguing. Choose the style that will compliment your Chinoiserie chic space the best. Protect lacquerware with inlaid mother-of-pearl and other stones from everyday use as it will likely dislodge the inlay over time. 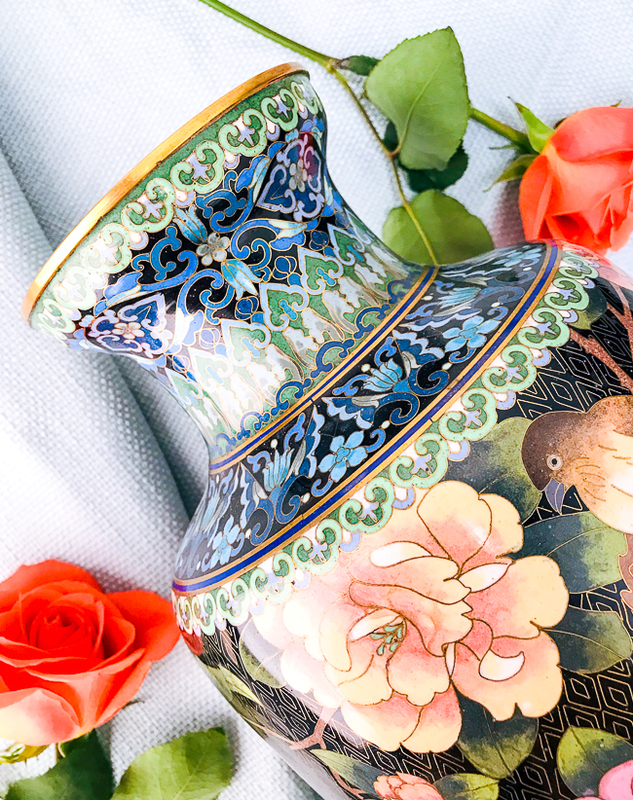 Get the Chinoiserie look with Asian or Asian inspired ceramics, cloisonné, and lacquerware. These 3 decorative accessories used strategically within any room will help you decorate in the Chinoiserie style. There is much to love and admire about the playful colors, elegant designs, and skilled craftsmanship of these objects d’art! Want more Chinoiserie decorating advice? 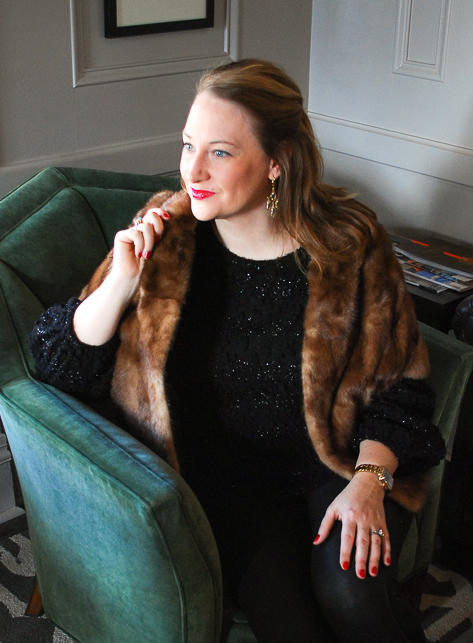 Read my 5 Chinoiserie Chic Decorating Tips! 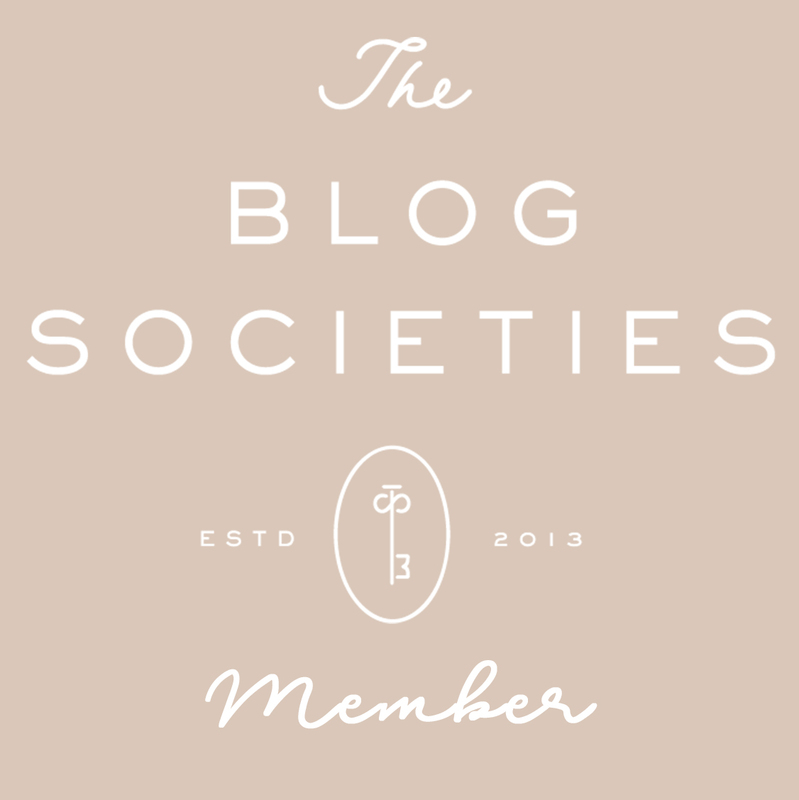 This is a very informative post geared to people like me who dabble in both collecting and decorating. Thank you for the explanation of these types of items. You are so welcome Margo! I’m glad you found the post useful! This is AMAZING! I’m literally bookmarking this post so that I can refer back to it from time to time. Thanks for sharing! Steph, I’m glad this post is so helpful and that you enjoyed it! Thanks for stopping by!